What is a banned or challenged book? Professor April Kendra of the English department joins Library, Museums and Press staff members Kathy Cephas, Amanda McCollom, and host Rich Campbell on this week’s “Campus Voices” to discuss this and other related topics ahead of the “Banned Book Read-Out” on campus next week. During the Read-Out, university community members will have the opportunity to read excerpts from a banned or challenged book. The Banned Books Read-Out will be held Wednesday, Sept. 26, on the UD Green in front of the Morris Library (rain location: Lecture Room, Morris Library). 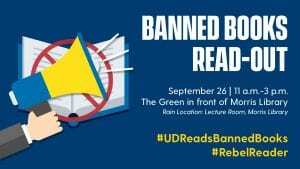 The Read-Out coincides with the American Library Association’s “Banned Books Week” which celebrates the freedom to read, and is sponsored by the UD Library, Museums and Press, the English Department, and Sigma Tau Delta, the International English Honor Society. Kathy Cephas is a Library Assistant in the Film & Video Collection, where she schedules showings and materials for faculty as well as helping students, faculty and staff with the vast DVD, VHS and video game collection. Amanda McCollom, Librarian in the Student Multimedia Design Center, is coordinator of the Multimedia Literacy program and assists faculty with multimedia assignment creation and teaches multimedia workshops. WVUD’s Rich Campbell also works as a Technology Support Specialist in the Student Multimedia Design Center, assisting students, faculty and staff with multimedia equipment, software and the microforms collection.